October 12 is National Day in Spain (Fiesta Nacional de España). This annual holiday commemorates the anniversary of Columbus' arrival in the Americas. This day is a holiday in many countries, but it's known under other names. October 12 is widely celebrated throughout Americas as Columbus Day (in the USA) or Día de la Raza (in the countries of Latin America). 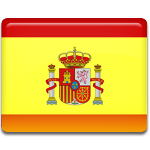 The Spaniards began celebrating National Day in 1935 as Dia de la Hispanidad, that emphasized their connection to international Hispanic community, the Hispanidad. The name of the holiday was changed in 1987 to Fiesta Nacional. The holiday became one of the two major Spanish national celebrations. The date of National Day had been moved for several times, until a compromise was achieved. The holiday coincides with Columbus Day, that emphasized the status of monarchy and history of Spain and commemorated Spain's burgeoning democracy with a national day. October 12 is also Armed Forces Day in Spain. The holiday was created in 2000 and it is celebrated with a military parade in Madrid.